In this photo dated Sept. 1, 1970, E.J. 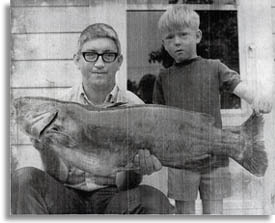 Bowden and his son Louis, then 5, hold up his record-breaking channel catfish, which weighed 23 pounds, 4 ounces. RALEIGH, N.C. – It was a chunk of shrimp that landed Rocky Mount angler E.J. Bowden his state record channel catfish back in 1970 and it was a stack of papers that gave him back the state record title nearly 39 years later. On Sept. 1, 1970, Bowden caught the state record catfish, which weighed 23 pounds, 4 ounces from City Lake in Rocky Mount, only to see it broken less than a year later by a catfish that weighed nearly 18 pounds more. Turns out, the fish that broke Bowden’s state record from 1970 wasn’t a channel catfish but a flathead catfish — a discovery made 34 years later after an article in the May 2005 issue of Wildlife in North Carolina printed an old photograph of Pete Paine holding up his record-breaking “channel cat” that was actually a flathead. With no channel catfish state records preceding Paine’s, the N.C. Wildlife Resources Commission vacated the channel catfish state record in 2005. In the four years since, the record has been “broken” three times, most recently by “Barbie Doll” angler David Hayes, who famously caught a 21-pound channel catfish using his granddaughter’s Barbie Doll fishing pole in August 2008. After seeing the media coverage about the various channel catfish state records being broken, Bowden contacted the Division of Inland Fisheries, which oversees the State Record Fish Program, and advised staff that the fish he caught way back in 1970 outweighed Hayes’ record breaker by more than 2 pounds. He even had a write-up accompanied by a picture from the Sept. 6, 1970 issue of the Rocky Mount Telegram to prove it. He sent in the paperwork that he had kept all these years, which, along with the Rocky Mount Telegram article, included a Xeroxed copy of the original photograph, a state record certificate, and an excerpt from a 1971 Freshwater Fishing and Hunting in North Carolina atlas, listing all of the freshwater fish state record holders of the day, including Bowden. After carefully reviewing the stack of documents and the photograph of the fish, Kent Nelson, fisheries program manager with the Commission, agreed with Bowden. He was still the official holder of the channel catfish state record in North Carolina. Nelson said the Wildlife Commission had no state record channel catfish paperwork prior to Paine’s 1971 record, which is why the agency vacated the record in May 2005. Without Bowden’s picture and accompanying paperwork, there would have been no way anyone would have known he was still the record holder. The fish itself was long gone, although Bowden said he kept it on ice for about 10 years, hoping to have it mounted one day. That day never came, so he left it in the woods for animals to consume. The Wildlife Commission now requires anglers seeking state-record certification for freshwater fish to submit with their applications a full, side-view photo of the fish. Additionally, anglers must catch their fish on hook-and-line only; weigh the fish on certified scales and have the fish examined by a qualified expert from the Wildlife Commission. Although he is now 70 and admits his memory isn’t as a good as it used to be, Bowden says he remembers the day he reeled in the record-breaking catfish quite well. He was fishing with his son Louis, who was 5 years old at the time, at the 10-acre City Lake, which is located off Sunset Avenue at the Tar River. The fish hit the shrimp chunk and the line started whizzing. He called Louis over to hold the rod, but soon realized that his son was no match for the fish and that this was no ordinary-sized fish.